Adolescent is the other named used for teenagers. Generally, the age between 11 – 18 years is considered as Adolescent. Here is the healthy diet plans for teenage girl. In the adolescent age period both men and women will experience many physical and mental changes. When there is no special concentration on their food in this age, teenagers will suffer from many eating disorders like anorexia nervosa, bulimia nervosa, etc. These disorders are seen because of high pressure and low self esteem. This is the age where teenagers experience a lot of new things especially girls. They become beauty conscious and stops to eat food while few addict to junk food. This leads to many health problems. Never starve yourself or stop eating food to look beautiful. This way is not a proper diet format. This process will impact of health disorders for life time. If the teenagers diet plan is poor or inappropriate it leads to health issues like diabetes, sleeping disorders, kidney diseases, cardiac arrest, nerve system damage and many other. To overcome these entire issues one must follow this healthy diet plans for teenage girl. 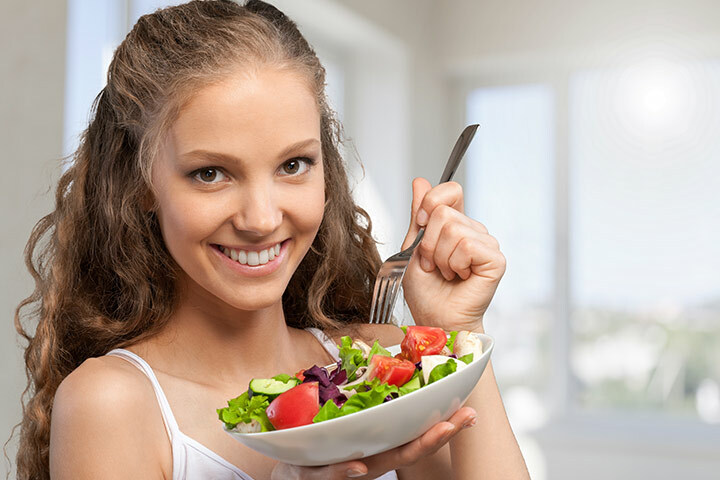 List of nutrients and minerals rich food required for the healthy diet plans for teenage girl:Every girl must follow the proper food diet to maintain their physique, to be healthy, to look beautiful, to stay fit and what not. Stopping themselves from eating food is not at all good for one’s healthy body. Here is the list of rich food which helps in all the possible ways to be fit and healthy. Calcium: Milk, cheese, yogurt, soybeans, nuts. Vitamin C: citrus fruits like orange, lemon, grapes, tomato. Vitamin D: margarine, cereals, oily fish. Proteins: red meat, fish, pulses, green vegetables. Cool drinks or fizzy drinks. Fast food or restaurant foods. High content of sugar / caffeine. Breakfast: Never skip breakfast. Eat breakfast like a meal. Include fruits, boiled / raw veggies, brown bread, juices, dry fruits, eggs in your menu. In between snacks: In between snacks are good time to drink juices instead of drinking any beverages or hot drinks. Lunch: In lunch add soups, salads, boiled veggies, sandwiches with multi grains, veggies and green leafy vegetable curries with chapatti or brown rice. Eat rice in very small quantity. Evening Snacks: Evening snacks are generally meant to relax and re energize themselves. So add more quantity of fruits, bread, juices, milk in it. Dinner: Dinner should be eaten in very less and limited quantity. It is best to eat salads, soups, fruits in night to maintain proper diet. Eating food time to time is must and should. Never skip any of the meal. Eat in limited quantity do not over eat as you are in healthy diet. Prefer healthy food all the time. Eat only home made food. Exercises are the best practice to maintain good body structure internally and externally. Exercise will make your body perfect and healthier than ever before. Regular exercise will achieve the life time results. Exercise like gym, aerobics, yoga, running, jogging and various other physical exercises will leave a very good impact on the body. Exercises will help in strengthen body, improves mental health, builds up confidence, acts as stress buster, provides never lasting energy, maintains good functionality of immune system and has various other benefits. A girl who is following this healthy diet plans for teenage girl should also take care of their health and follow this accordingly. Stay healthy! Be fit! Be Confident! Love yourself! 0 Response to "Diet Plan for Teenage Girls to Manage Weight Easily"